Tamarind sauce is a critical ingredient in many Thai foods, including the famous Pad Thai. Tamarind sauce is commonly used in various northern Thai dishes as a souring agent. Tamarind is also used in the manufacturing of ketchups, sauces--Chinese, Worcestershire, Barbecue, etc. Tamarind is effective as a natural preservative and marinade. 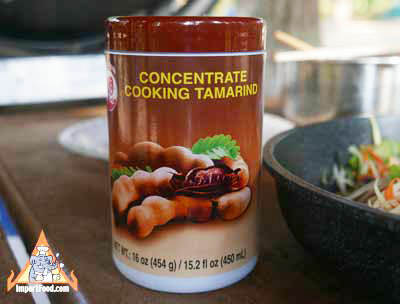 Usually tamarind paste is mixed with water and strained, the resulting tamarind juice being what's used in Thai recipes. Our tamarind conentrate is a concentrated form of tamarind juice (and very convenient to use because it removes the need for mixing & straining). With tamarind concentrate you can prepare most recipe that calls for tamarind, but there are some recipes that call for pure tamarind paste. See a selection of recipes below that require tamarind, and detailed photographs of natural tamarind fruit and trees. Thailand grows a rich, full tasting fresh tamarind that is regarded around the world as the finest quality available. Ingredients: Tamarind, water, sodium benzoate. This is a simple, Thai-style, sweet and sour sauce. Note that it isn't pink! The sauce is spicy and has complex flavors. Serve with any grilled meat. We enjoyed it here with chicken, som tum, sticky rice, and hard-boiled eggs.